This second part is about what you could do when you get here. You can read part 1: how to get there and where to stay here. 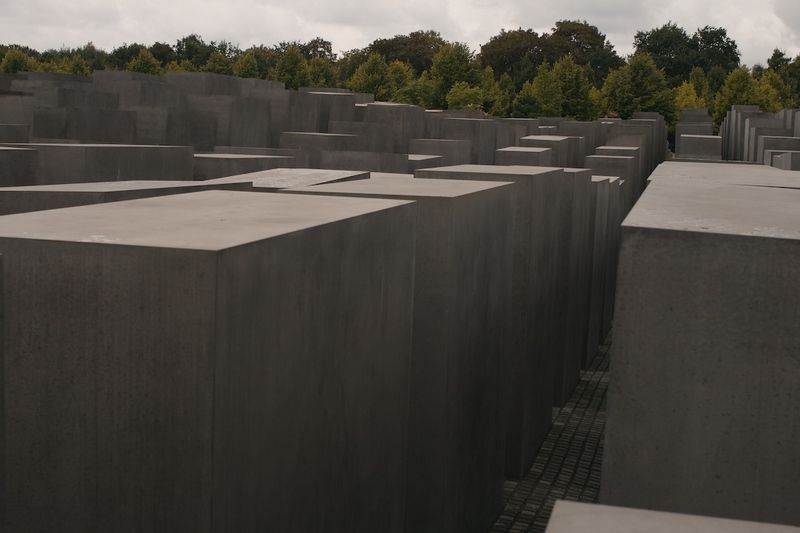 An essential visit for any tourist is a to the Holocaust Memorial (map) (officially called the Memorial to the Murdered Jews of Europe), which is nearby to the Brandenburg Gate (map), the Tiergarten city park (map) and the parliament buildings (map). Try to go to the memorial early, because later on you’ll find groups of school children who don’t afford it the respect it deserves. Hackesche Höfe (map) is a mix of eight courtyards is an architecturally interesting of business and offices, residential housing, entertainment venues, art galleries, boutiques, bars and restaurants. The Jewish cemetery on nearby Große Hamburger Straße (map) was destroyed by the Gestapo in 1943 but can still be visited, provided it’s not Friday night or Saturday (which is the sabbath). Men must have head covering. Outside the cemetary stands a memorial to the 55,000 Jewish Berliners who were murdered. The nearby synagogue (map) can also be visited, although again only on weekdays, not the sabbath, unless you’re going to pray. The Jewish museum contains not just stories of ethnic cleansing, but the fascinating history of Jewish people in Germany, in an astonishingly beautiful building designed by Daniel Libeskind. This 2km long street running from Alexanderplatz to Frankfurter Tor U-Bahn offers a wonderful view of soviet architecture. The stunning looking homes lining it were built as “workers’ mansions”, and it was hoped that one day all East Germans would live in similarly well appointed buildings, with lifts and rubbish chutes. Sadly, many of the buildings are currently poorly maintained on the outside, and have nets to catch falling masonry. However, the buildings still look impressive, and the road is well worth a visit. When Berlin was a divided city, the Berlin Wall erected in 1961 ran along this street; it became famous for people trying to jump from the the back windows of their East Berlin flats, into West Berlin, and for escape tunnels which ran underneath the wall. Today, a long exhibition runs along the wall’s former route, with a section of “death strip” still there (map), complete with the original two walls, high powered lighting, and watch tower. I jumped on top of the inner wall, which used to be in East Berlin, and took this 360º panorama. It’s sobering to note that if I’d sat there just a couple of decades ago, I’d have been shot. The massive Soviet War Memorial (map) in Treptower Park commemorates the 50,000 Soviet soldiers who died in the Battle in Berlin in April–May 1945. The rest of the park runs along the River Spree and is well worth a visit. Sadly it’s cut in half by a busy three lane road. Tempelhof Airport became famous worldwide for the Berlin air lifts during the cold war. It functioned as an airport until 2008, then, after a while, then reopened as a large public park and event space. Most of the roadways are free for public use, and cycling or skating along the 2km runways can be a lot of fun if you don’t have a headwind. You can also picnic on the vast grassed areas, though, being an airport, there aren’t too many trees for shade. There’s also little a little café and separate fenced areas to let dogs run around. A number of areas around the park are dedicated to community projects, and anyone is able to submit a project for approval and be given a small piece of land. If you’ve been to Berlin, where are your favourite places to visit? Please let me and others know in the comments below. Please don’t take profile photos for online hook up sites when you’re hanging off a piece of the Holocaust memorial. Really poor taste!…and happening too frequently! !